Don't let your fear of affordability be an issue! Last year $165,000 was awarded in financial assistance. 50% of current families receive financial assistance. **for every family you recruit you will get $500 tuition credit. Discount will be applied on April 1st of the school year if the recruited family is still enrolled at SATG. The Registration Fee is due to secure your child's seat for the 2019-2020 school year. The Materials Fee is due before school begins in August, but is more affordable the sooner you pay it. See the chart below of months and dollar amounts. Registration Fees and Materials Fees must be paid in order for your child(ren) to begin the school year in August 2019. The Materials Fee secures all consumables needed for the upcoming school year including technology usage and dues to the FSA. This fee must be paid by the 1st day of school in order for the child to attend classes. The Materials Fee is prorated in order to make it more affordable for families. 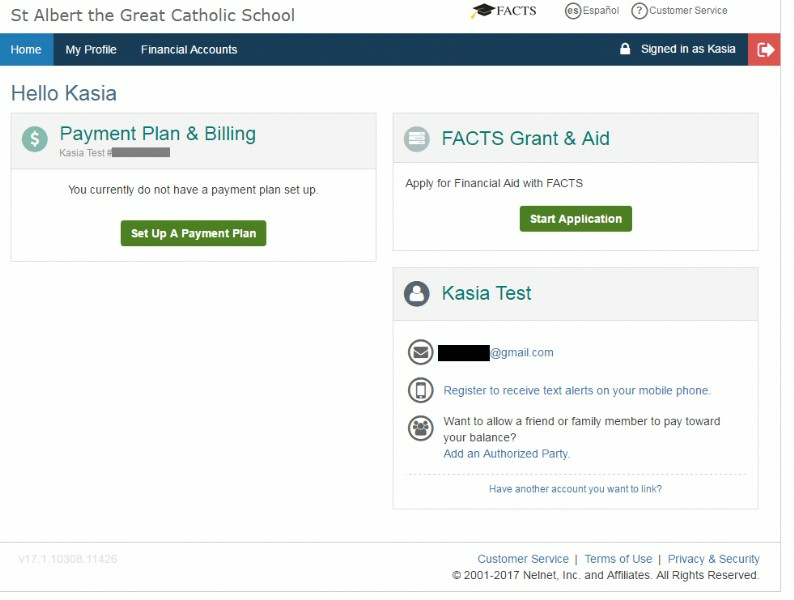 St. Albert the Great utilizes an online, web-based portal, FACTS Tuition Management Services. This web-based service allows parents to register for a payment plan and/or make a full payment via the web. It is hosted on secure servers and is accessible through your online FACTS account. Throughout the year, parents can log in to a password-protected site to check the status of their account, pay tuition and fees online, update demographic information, switch payment methods if preferred, and more -- all with the click of a mouse. This password-protected and encrypted site gives parents a full report of payments made, those still scheduled, and any account adjustments. All families are required to create a FACTS online account for managing their tuition payments. SATG Finance Committee: (708) 529-5506 or email: satgsfinances@gmail.com. This is the page you will see when applying for Financial Aid. Please call the school with any questions regarding the FACTS Management System or tuition at (708) 424-7757.